It’s Halloween season, and many children and adults look forward to this spooky night, but tricks and treats can be overwhelming and hazardous for pets. Noises, smells and people in costumes can startle many pets, while other activities can even be dangerous. 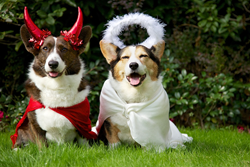 Amica Insurance is sharing Halloween pet safety tips from the American Veterinary Medical Foundation and the American Society for the Prevention of Cruelty to Animals. It’s Halloween season, and many children and adults look forward to this spooky night. But tricks and treats can be overwhelming and hazardous for pets. Noises, smells and people in costumes can startle many pets, while other activities can even be dangerous. Stash the treats: Chocolate in all forms – especially dark or baking chocolate – can be dangerous for cats and dogs, and sugar-free candies containing the artificial sweetener xylitol can cause serious problems for pets. If you suspect they have ingested something toxic, call your veterinarian immediately. Watch the decorations and keep wires out of reach: Be aware of which decorations pose threats to curious pets. Some can make your pets, especially cats, nervous or frightened. Be careful with costumes: Make sure pet costumes fit properly and are comfortable, don’t have pieces that can be chewed off and don’t interfere with their sight, hearing, breathing, eating or moving. Never leave pets unsupervised while wearing costumes. Keep pets calm and easily identifiable: Strangers can often be scary and stressful for pets, so keep them in a separate room away from the front door during peak trick-or-treating hours. While opening the door, be sure that pets don’t dart outside, and always make sure they’re wearing proper identification in case they do escape. Amica Mutual Insurance Co., the nation’s oldest mutual insurer of automobiles, was founded in 1907. The company, based in Lincoln, Rhode Island, is a national writer of auto, home, marine and umbrella insurance. Life coverage is available through Amica Life Insurance Company, a wholly owned subsidiary. Amica employs more than 3,800 people in 44 offices across the country. For more information, visit Amica.com. Media inquiries can be sent to MediaCenter@amica.com.